Until the opening of the Erie Canal in 1825, Buffalo was a sleepy town. Access to an abundant supply of fresh water led to a thriving farming industry, provided a means of transportation, and powered mills and factories. Adding to the hustle and bustle of the city's busy new harbor was Joseph Dart's local invention of the grain elevator. Buffalo's location on Lake Erie, and its growth during the second industrial revolution, helped the city become the eighth largest in America and established it as the Queen City. It has been home to future presidents -- Grover Cleveland is the only big city mayor to win the White House -- and inventors who have influenced millions. Without Willis Haviland Carrier's air conditioner, developed while he was at Buffalo Forge, it might not have been practical to settle America's Southwest. 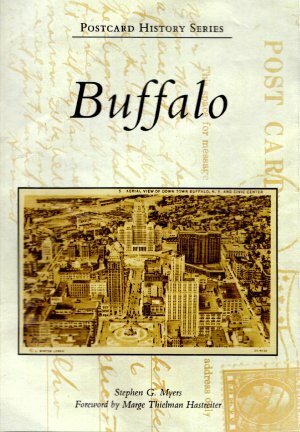 Buffalo's original radial street design, the layout of its parks, and its majestic architecture make the city fascinating and unique. Those qualities were reflected in the early postcards of the day, and a collection of remarkable and striking postcards are captured in this book.